Those who attended yesterdays meeting will have seen just how many people possess RSU's and how they use them in different ways. The pictures show aspects of the meeting. 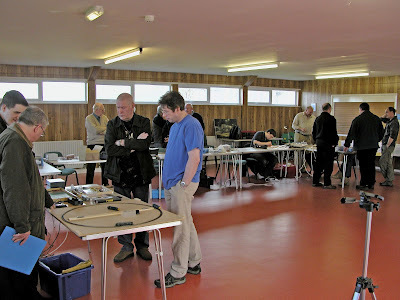 In addition to the RSU session Bob had a lump of Fence Houses upon which were running some of the various members projects. 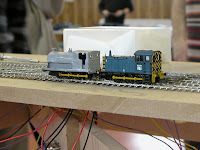 I was playing with Dynamis using my 2'6" diameter circular test track and at one time had 3 class 37's chasing themselves. Can be a bit nerve racking can that - with such a small circle of track.